Note-taking tools are in abundance at the console, and some of them are so simple as to be almost rudimentary. Even I am guilty of stashing a few oddball commands in a flat text file called “tricks,” and just grepping through it when I need to find something. The irony of that is that there are many other applications that would do much the same thing, and have internal tools that would save me time and trouble. 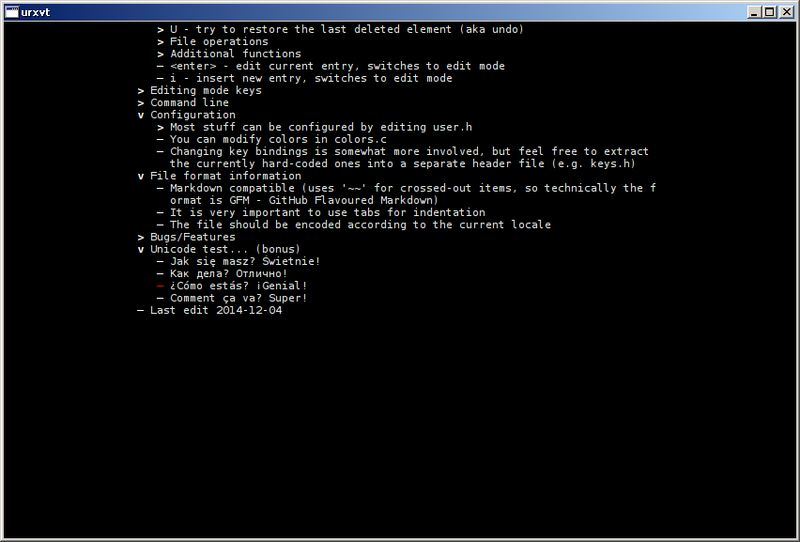 note, for example, has a clean and easy to manage format, and an interactive mode to boot. You can kick note into action with just the note command and a flag or two, or you can access its primary functions through the captive interface, like above. Add a note or edit a note, and you drop into your $EDITOR … and I always like it when note-taking tools do that. Afterward, you can delete notes or even search through them, and you don’t have to rely on shell commands or external programs, unless you want to. note also supports a “hierarchical” structure that it calls “topics.” If the first line of your note shows a topic path — like “/Wash/dog/” — note will arrange it and list it in topical sequence. This isn’t quite as elaborate as what hnb or tudu can do, but it’s a nice feature. 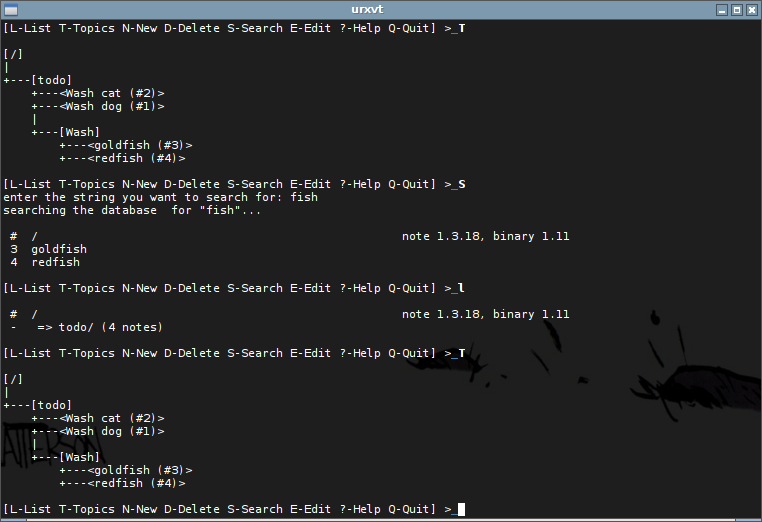 note has a few other configurations worth mentioning, and the man page is there to walk you through most of them. I was able to install and start using note in a matter of minutes, so unless you need very explicit and esoteric features, it should have replaced your flat-file-plus-grep in very short time. I don’t see any features on prioritizing, check-box to-do lists, or advanced sorting and management. It may be that those features are better implemented in other tools. This entry was posted in Linux and tagged editor, manager, note, task, to-do on 2015/02/23 by K.Mandla. 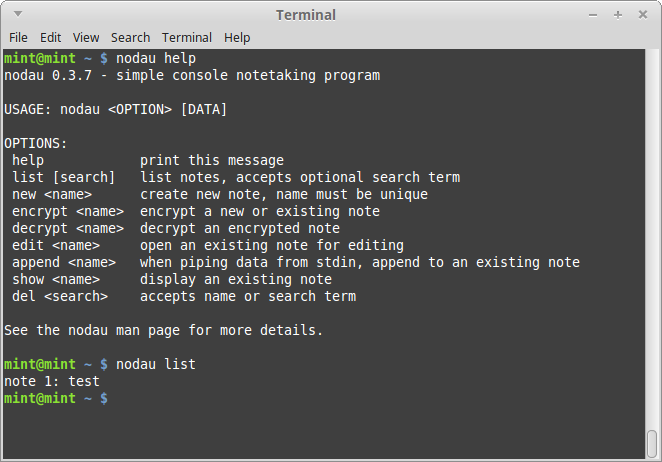 nodau, which is the last title for today, is a very simple note taker — in fact, both the Debian version and the AUR description say so. Okay, bad joke. The implications of that empty space in the Whirled Why’d Web are few, but noteworthy 😉 : Arch users who want to give this a try will probably need to wrangle with the source code (which is newer) mirrored in the Debian version. First, a quick overview. 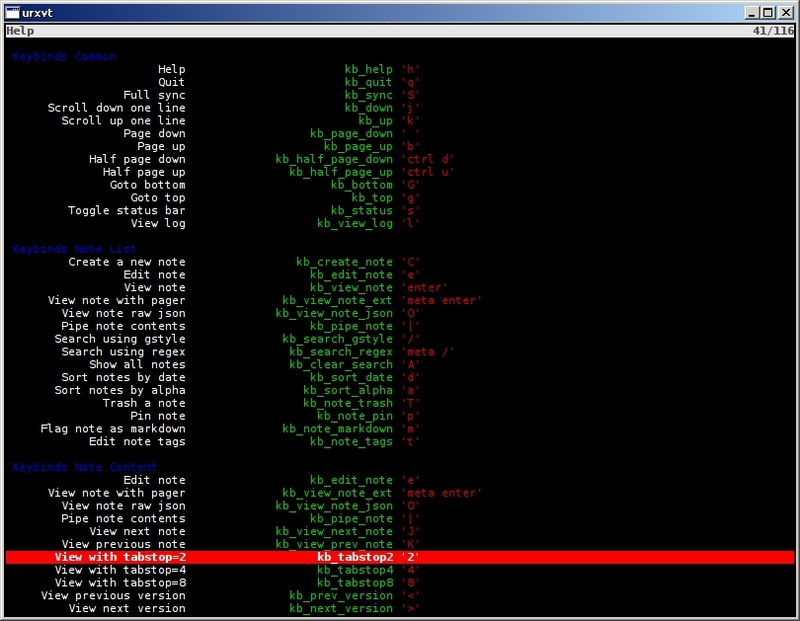 nodau works in a command-interpret style, with the nodau executable taking a command and doing as it’s told. nodau help lists all its vocabulary. nodau list shows you all the notes it has on file. And so forth. It’s not an innovative style, but it’s quick for adoption. nodau is smart enough to grab your $EDITOR if you declare one, and let you use that in your notable adventures, so if you’re severely addicted to vim or emacs, don’t feel like you’ll have to learn an entirely new editor. On the other hand, if you are among the sane members of Homo sapiens who reside on this planet (or off it, I guess 🙄 ), nodau provides its own, very basic, very simple text editor to supplement its filing and listing abilities. It’s not flashy and wouldn’t make much of an impression were it to grace this list of its own merit, but it will do. So you have that ability — to swap out the editor that nodau uses. I like that. Once encrypted, a note becomes obscured and won’t be readable or editable without a password. Tell nodau to unencrypt it, and the note returns to its plain text heritage. I will let you research and judge if nodau’s encryption will pass muster, but I think short of security geeks, criminal cartels and corrupt governments, it will probably offer a reasonable degree of protection. From what I can tell, nodau keeps its data in ~/.local/share/nodau/, so if you go looking for a local copy, I’d encourage you to start there. And yes, I checked, and the encryption appears effective at a cursory glance. This entry was posted in Linux and tagged editor, encrypt, file, note, text on 2015/01/17 by K.Mandla. If you’ve been reading this site for a while, you’ll know I was a long-time, die-hard fan of hnb, a note-taking application with a branching structure. It is a very old program — probably second-only to sc, among dated applications that I still used on a daily basis — but never failed to build or do the job. So I have fond memories. And I’m intrigued that there’s a redrafting of hnb available, running under the name of snb. And it has a lot of the allure of the original, with a few additions. As I understand it, the biggest draw might be the availability of Unicode characters, provided of course that your terminal supports them. snb also handles checklists or to-do lists after a fashion, allowing you to tick off an entry with the “d” key. Movement is primarily vi-ish, with the shifted HJKL keys dragging entries up, down, in and out of branches. Most of the other keys you can find in the default page for snb, which will open if you don’t give it a file at startup. If I understand the startup pages, any configuration is going to require editing the source files and recompiling. That’s probably not a huge inconvenience, and looking over the user.h file, it’s not so terribly different that you might have trouble. I like snb and if I had found it about six months ago, before I came across tudu, I might have jumped ship in that direction instead. As luck would have it, I’ve gotten used to some features that tudu offers, and stepping away from those isn’t appealing. snb is a good project though, and I’m curious to see how it evolves. This entry was posted in Linux and tagged manager, note, organizer, task, to-do on 2014/12/14 by K.Mandla. And true to form, sncli kept the online version up-to-date with my changes. Quite quickly too, I might add. 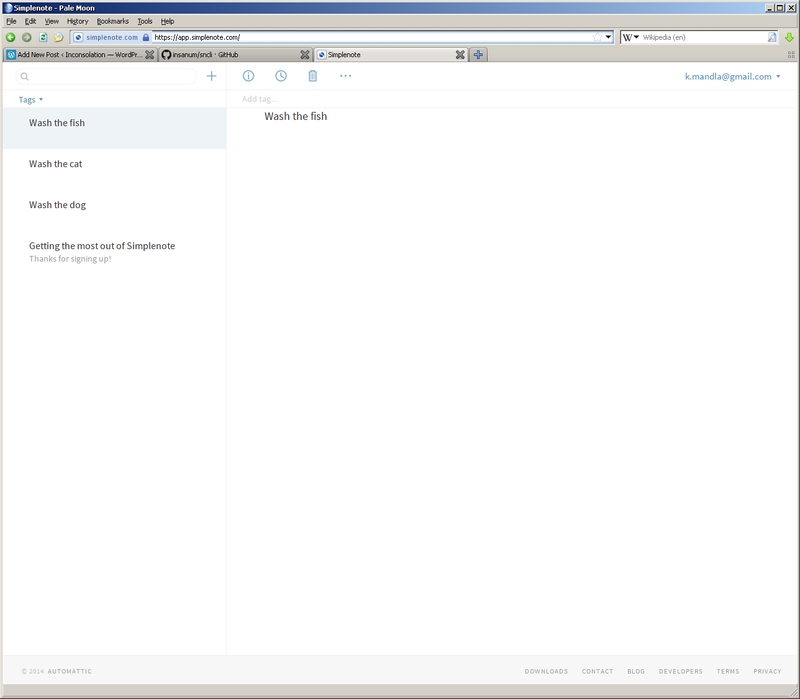 Simplenote had my changes from sncli online before I had clicked on the tab. As I can see it, from what I’ve learned about Simplenote and from working with sncli, the real value in this is the ability to access to-do lists and reminders from devices other than your old 133Mhz Pentium laptop. I don’t have a smartphone (only dumbphones) but if I did, it would be nice to see those lists update between sncli and the web interface and the mobile phone. sncli itself has more to love than just the color scheme. Off the bat it’s easy to see how it works, and if you’re a fan of the vi-ish control scheme, navigation will appeal to you immediately. You can add a note with “C”, edit one in your $EDITOR with “e”, sync with your online account with “S”, and so forth. Easy to use and remember. 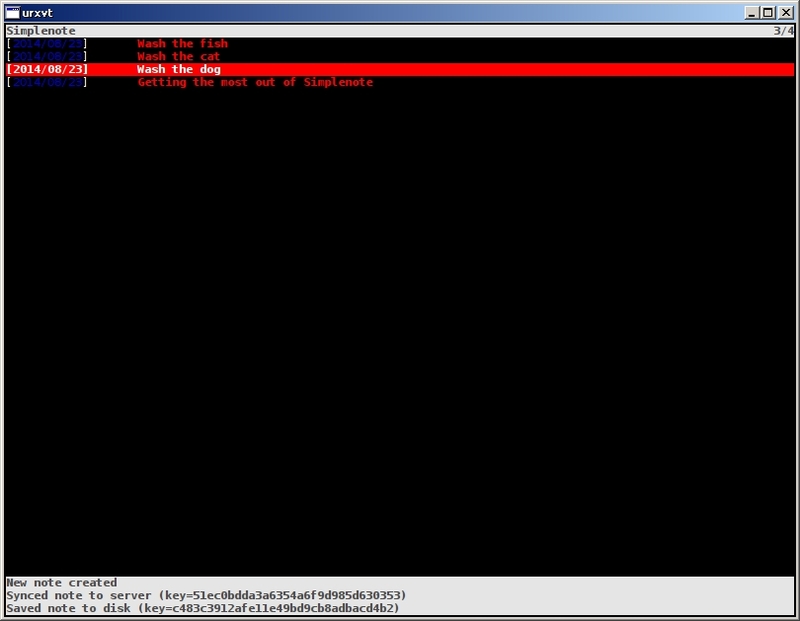 Provided you have a Simplenote account, you can configure sncli with little more than your account name and password. Add those to .snclirc and you’re ready to go … keeping in mind that those are stored in plain text. That would be only one of my very few suggestions for sncli at this point: Find a way to manage an encrypted password, perhaps along the lines of how gcalcli handles it. Considering gpg is available on just about every system out there, it should be an easy dependency to fulfill. I like sncli a lot — particularly for the easy setup, good use of color, excellent use of screen real estate, near-immediate synchronizing with the online service, intuitive commands and onboard help. … Oh heck, what’s not to like? Well done. Have a K.Mandla gold star: ⭐ 😉 Enjoy! This entry was posted in Linux and tagged cloud, list, note, notes, online, task, to-do, web on 2014/08/24 by K.Mandla. My mental system of categorizing software is breaking down with tnote. I’m not sure exactly what box this should be in. It is possible to assign importance to notes, much like a task organizer. There doesn’t seem to be any way to tick off or “complete” notes. All of the features I listed above are described in the man page and help display for tnote. What I didn’t show very well in the screenshot gif, is that tnote intends for you to make long, rambling notes and includes an option for a “brief” display of only the first line. Second, tnote seems to display a lot of white space after the note list, and I’m not sure why. None of my notes included empty white space or blank lines (not just the blank line I include as part of my $PS1). I noticed that white space wasn’t in the “brief” display, so perhaps it’s just a quirk. I like tnote a lot; it has some good features and for the most part does what it promises. It’s a bit of a hybrid, incorporating the ideas in several different groups of programs and making them work in a new way. This entry was posted in Linux and tagged data, note, notes, organizer, task, to-do on 2014/06/04 by K.Mandla. The home page for tina describes it as a “text-based personal information manager.” Which … I guess is true. tina takes text data of any sort, and allows you to apply categories — much like you might do with a task organizer or perhaps a to-do list. Controls are very vi-esque. Press o or SHIFT+O to add an item anywhere in your hierarchy, then press SHIFT+C to “categorize” it. There are navigation, cut, paste, search and other tools available, most of which follow the vi arrangement. Where tina loses me is when categories themselves get categorized. Apparently it’s possible to categorize the category, then again and again and again. And it’s also possible, although I’m not sure how I did it, to loop back from a category to the original data set, meaning there’s a circular structure that crops up. That might be just my whacked-out attempt to learn tina though. So if that’s weird for you, just ignore it. On the other hand, that might be useful. tina saves its data as flat text files, and picking through those might give you some insight as to how tina is meant to be used. This entry was posted in Linux and tagged edit, manage, note, organizer, task, to-do on 2014/06/02 by K.Mandla.